• Home Pub: Wynkoop Brewing Company Denver, CO – I never miss a Friday there! • Author and teacher of the “Beer 101” course. • Seven taps in my basement brewery/pub, including one handpump/beer engine. • Three refrigerators at home exclusively for beer and brewing. • Visited 19 countries on four continents in search of beer history and culture. • Over 200 breweries visited, thousands of beers tasted. • American Homebrewers Association (AHA) member since 1991. • International Beer Club member since 2000. • Frequent all local beer festivals, as well as many other U.S. and International events. • Extensive library of books and magazines on beer history, appreciation, and brewing, in both English and German. • Creator and administrator of the wynkoop@msupikes.com email list. • Tireless advocate of beer culture and responsible beer drinking. Everything I do, and every decision I make revolves around beer. I am a tireless advocate of beer culture and the brewing industry. Beer is my passion. Beer is the most diverse and complex drink known to man. Beer’s history and roots are humble, making this fact seldom discussed, but it is true. An infinite number of combinations of malts, hops, yeast strains, microorganisms, sugars, and spices make every beer unique. Not to mention other variables such as carbonation levels, serving temperature and dispensing methods. The craft brewing revolution of the past two decades has enlightened this country. A positive side effect of the brewing revolution is that people are becoming more responsible drinkers and are starting to appreciate the finer qualities of beer. No longer is beer a simple drink of intoxication, rather it is a sophisticated, complex beverage that deserves to be appreciated much in the manner that a fine wine, Port, or single malt Scotch Whisky is appreciated. Beer is a civilized drink. The brewing revolution we currently enjoy should not be taken for granted. In 1880 there were 2,300 breweries in the U.S., but after the repeal of prohibition in 1933 there were only 160. Luckily today, the U.S. boasts more than 1,400 breweries, but there are still dry counties and states that do not explicitly allow homebrewing. As members of the beer community, we need to recognize the wonderful beer culture afforded to us and never take it for granted - and also remember there is still work to do. If beer lovers do not support their craft brewers and local brewpubs, the wonderful choices we have today will dwindle. It is important to rally friends to support the industry, its breweries, and its festivals & events. That is what beer is about, friendship, good times, and enhancing any pursuit. To me beer is a lifestyle. I live every day as a beer consumer, brewer, and teacher preaching this theme. and appreciation for beer. To this day I keep in touch with Huber and his son Karl, who has since replaced his retired father as head brewmaster, and I visit the brewery every opportunity I get when I’m back in Germany. Since that special encounter in 1988 I have traveled across the United States and to every corner of the earth in search of beer knowledge, beer culture, and the elixir of life. I have toured and visited over 200 breweries in 19 countries on four continents – every hemisphere on the globe. As a small sample of highlights: I have had the privilege of drinking cloudy Pilsner Urquell straight from its oak lagering vessel; learned to open ferment my homebrewed beer after touring several small European monastic breweries that still, very successfully, practice this technique; smelled the delicious and distinctive musty aroma inside the Cantillon lambic brewery in Brussels; taken dozens of friends to the nearby Coors brewery – one of the few opportunities to see a working maltings (my father grows 2-row barley for Coors in Montana); and was pleasantly surprised by the quality and selection of beer styles after touring microbreweries in Tokyo, Japan. These are just a few examples. Each visit to another region or country brings new flavors, knowledge and experiences. I carry the memories from these very special moments with me every day. 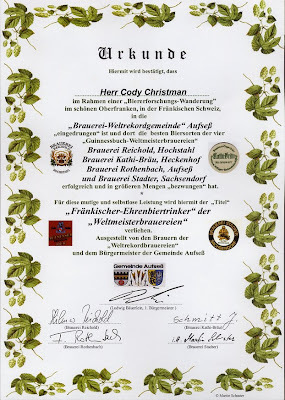 One additional experience I am especially proud of - in the summer of 2006 I was honored to be named “Fränkischer Ehrenbiertrinker” (honorary beer drinker of Franconia, Bavaria, Germany) by the community of Aufseß and its four breweries. I have posted the Urkunde at the end of this Resume. If you have a second, please check it out. I plan my life around beer festivals. When possible I take in my favorite German events, Frühlingsfest (Munich), Herbstdult (Amberg), Fest der Bayern (Regensburg), and of course Munich’s Oktoberfest. And the Denver area, the “Napa Valley of Beer,” offers numerous fests that I frequent, both in the foothills and in the mountains, and I never miss my two favorite events, the Great American Beer Festival in Denver and the Colorado Brewer’s Festival in Ft. Collins. My basement is a shrine to beer and brewing. The decor is modeled after the Stockhammersaal (beer hall) in Augustiner Bräu’s Kloster Mülln brewery in Salzburg Austria. Behind my 15-foot bar are two industrial refrigerators and seven faucets – six German made, and one English Angram handpump beer engine for dispensing my cask-conditioned ales. I employ three refrigerators exclusively for beer. I always maintain an International offering, a local specialty, and several of my homebrews on tap. I am meticulous about serving beer in the appropriate glass, so I have wall-sized glass rack with 23 different glass styles to suit this purpose. The basement also serves as my brewery. I’ve brewed my own beer since 1990 when the founding partner and brewer of the Wynkoop, Russ Scherer, spurred my interest. Contest judges and my friends claim that my beer is consistently of high quality. 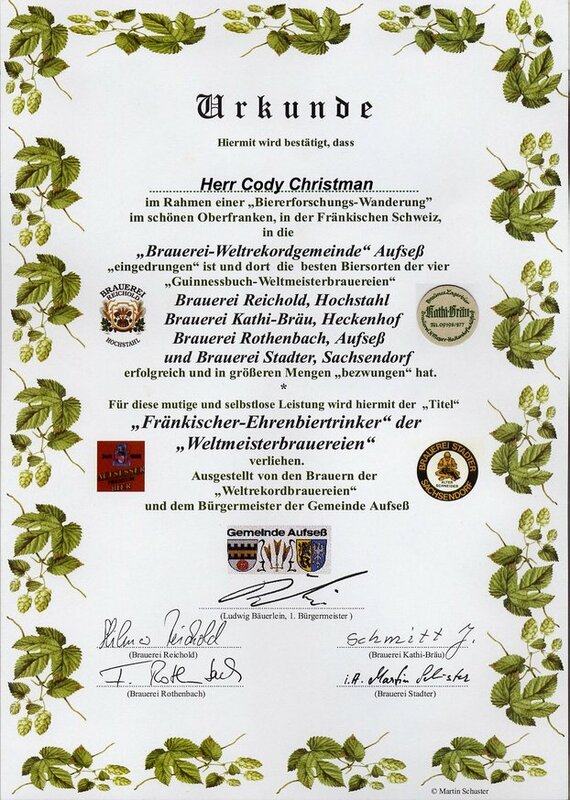 I have won several awards over the past 18 years, the latest being a 1st place in the AHA Mountain Region for my Old Ale that was over 6 years old when entered. So much for Anheuser-Bush’s claim that beer cannot taste good unless it is “fresh.” I enjoy the process of brewing itself, but it also helps me better understand and appreciate different styles of beer. I tirelessly promote beer culture and responsible beer drinking. My International Beer Club membership supplies me with four monthly offerings that I share with friends to expand their knowledge of various rare brands and styles, and provides a great opportunity for us to discuss tasting notes and food pairings. I’ve been an AHA member since 1991, and have encouraged numerous others, Homebrewers or not, to join. I am also a member of CAMRA. I regularly organize group outings for local beer festivals. I’ve encouraged numerous other friends and co-workers to take up the hobby of homebrewing. I evaluate and critique their beers, and ask the same from them of mine. Eleven years ago I created, and still maintain, the wynkoop@msupikes.com mail list to keep friends that frequent our local pub, the Wynkoop, up to date on beer related events and activities. I started 2008 by writing a class I call “Beer 101.” The idea came to me after observing many people happily drinking craft beer, yet, at times, knowing little about beer styles, history, ales, lagers, etc. Beer 101 is a 5-hour course that graduates often call “Beer 401.” The course covers beer history, styles, raw materials (fresh malt and hops are handed out to sample), trends, religion, myths, as well as discussion of the leading brewing countries of the world. (Belgium, Czech Republic, England, Germany, Ireland, Scotland & the United States) It also covers trivial matters like Gambrinus, brewery cats, and the terrior. There are 14 quiz questions during the course. Students receive a bottle cap for the each correct answer, and at the end of the class the person with the most caps wins a prize - a unique cork-finished specialty beer. All I ask of students is to bring their favorite sampling glass, a steak, and $20 to cover the cost of the 15 beers I provide from 7 different countries ranging from ales/lagers/sour, light/dark, hoppy/malty, barley/wheat, to Rheinheitsgebot/spiced. These beers are sampled and discussed during the course to reinforce the topic being covered. Half way through we break for a steak dinner. I provide the sides. I have taught this course several times already this year in my basement, and plan to continue. I am also in discussion with an alehouse/bar to teach the course to their staff and small groups of patrons. In addition to writing and teaching my new course, this year I also continued my travels to the furthest reaches of the world in search of great beer. This year’s destination was Scandinavia. Here I was exposed to some real treats. The main highlights were visiting Stavanger’s Gladmat food & drink festival, which featured numerous Norwegian craft breweries displaying their unique specialties; spending a night in Stockholm’s Akkurat pub, which offered a phonebook sized menu of specialty beers including numerous vintages of famous and rare Belgian bottle conditioned ales; and finally a tiny cellar pub in Helsinki that served an ancient beer brewed by the indigenous Sami people of northern Finland that was a dark, murky, flat, estery & phenolic delicacy served directly out of a weathered oak cask. Though this part of the world is usually known for its spirits, not beer, it offered some of the best beer experiences I’ve ever encountered. Since before I was of legal drinking age, I have been a tireless advocate of the worlds greatest, most diverse and complex beverage - beer. I have carried out this role as a consumer, homebrewer, and teacher. I will never cease this life long passion. But I would be honored to carry out this work under the title of “Beer Drinker of the Year.” In the 12-year history of this great award, there has never been a winner from a non-costal state. Not one winner from the central or mountain time zone - not one winner from the heart of the country. As a native Montanan, and proud resident of the great brewing state of Colorado since 1991, I would welcome the opportunity to represent Middle America as one of the three finalists in Denver next February, and take a shot at this prestigious title. Thank you for your consideration!